What does love mean to the producers of Everlasting? How do they feel about the notion of fairy-tale romance? Do they believe in it? Do they think it can be attained and maintained? Though Rachel, Quinn, Chet, and the others haven’t said so explicitly, all signs point to yes. At their core, they are hopeless romantics, which is deeply ironic considering they devote 16-hour days to making “love” out of nothing at all. This is the internal contradiction at the heart of UnREAL, one that reveals another limitation to the show’s nifty, novel concept. The work people do has a profound effect on how they see the world. A cop is bound to have a different perspective than, say, a guy who spends his day inflating bouncy castles for children’s birthday parties. And if someone’s work entails creating the illusion of love where there is none, it’s hard to imagine that person keeping a sunny outlook on the possibility of happily ever after. The love on Everlasting is make-believe, but the cynicism is real. 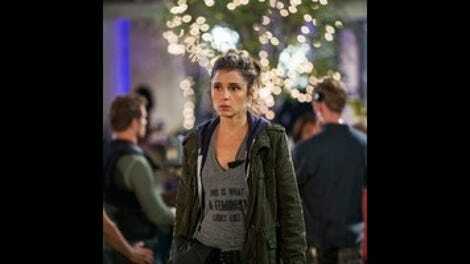 Yet, in “Two,” none of UnREAL’s principal characters display that cynicism except when discussing production of the show. In one scene, Quinn descends the stairs of Everlasting mansion to find the first floor bathed in candlelight and dusted with rose petals. She reflexively grabs her walkie and goes into crisis mode, barking at no one in particular about what she thinks is a production miscue, only to find Chet has set up a romantic dinner for her. Chet proposes with a mammoth diamond, and Quinn happily accepts. Meanwhile, Jeremy is consumed by his tryst with Rachel, so much so that he pledges his love for her and breaks off his engagement with Lizzie. But when Jeremy arrives at Rachel’s trailer to formally rekindle their relationship, she’s off bedding Adam, the long-awaited consummation of the closest thing UnREAL has to a genuine romantic connection. Nighttime soaps thrive on their romantic pairings, and so must UnREAL. But the show has to sell the idea that Chet, the man with the freshly inked divorce settlement, and Quinn, the ice queen who wishes people would just shut up about Mary, can create a moment of romantic bliss in the house that’s still technically a crime scene. It all works quite well as plot, but it’s near impossible to emotionally invest in any of these relationships. When Quinn stumbles onto Chet getting serviced by Madison, the once naive production assistant, her fury is understandable. But her surprise? Less so. Take away the fact that Quinn was the other woman for years, and it’s still crazy for her to think happiness awaits her and Chet. She’s the Greece of karmic debtors, and probably the last person deserving of wedding bliss. It’ll be exciting to see what Quinn does as a woman yet again scorned, but as is often the case with UnREAL, the audience has to accept almost as much contrivance as Everlasting’s audience does. But somehow “Two” defies gravity, like most episodes of this show, and it works even when it doesn’t quite work. The success is mostly due to Rachel’s story, which finds her willfully letting go of her last shred of human decency to advance her career. Chet and Quinn sell the network on the idea of an Everlasting spinoff called Royal Love, in which Adam and Grace, who would ideally get married on live television, would return to Adam’s home to start their pretend life together. (Now that Grace has revealed her severe claustrophobia, it seems like Love In An Elevator would make the better concept, but whatever.) Rachel is unusually hesitant about working her reality-trash voodoo on Adam, but she gets in the game when Chet offers to make her the showrunner on the spinoff. It’s a classic example of the conundrum Rachel finds herself in again and again. She hates the awful things she has to do for her career, but like anyone, she’s gratified by doing a good job and being recognized for it, even when this is the job. Adam is staunchly against the whole thing, especially the notion of getting married to a woman he barely knows, as if that isn’t the entire point of this sham. But once again, Rachel and Adam team up to disrupt the plan for their own gain. Instead of returning home to England with Grace, Adam will remain Stateside with Anna as his fiancée, and they’ll spend the year renovating Adam’s vineyard. It’s an elegant solution, and one that suggests how the second season will find a place for Adam after his Everlasting season concludes. That means the relationship between Rachel and Adam could be a long-term one, but they’re fools if they think their love story has a happy ending. I’m totally baffled by how Shamiqua’s story fizzled out. I still know nothing about that character other than the fact that she went to Spelman, and I don’t see what was the point of keeping her until the final four if there was no plan to integrate her into the story. The show flicks at the racial undertones of a show like Everlasting, but seems as uninterested in defining its women of color as The Bachelor. You’re right Shamiqua, this was a huge waste of your time. Is anyone beat up about Jeremy and Lizzie? I wasn’t remotely affected by that scene, I must admit. I’m tired of dwelling on the Mary insanity, but I have to say, the notion that Everlasting would not only stay on the air, but would get a 22 percent bump from Mary’s suicide… it’s just insane. It’s insane. This show is not tethered to the reality of reality.